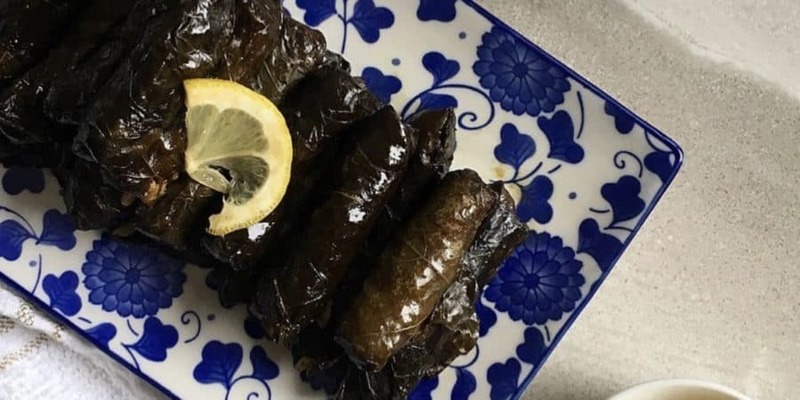 Growing up in a Middle eastern household, stuffed grape leaves were a staple on a dinner table especially for occasions. These are called waraq ainab or dawali in Arabic but they are known in different countries by other names. I can’t tell you how much I enjoy eating these! At first, I used to think they were such a hassle to make but they really aren’t once you get the hang of things. Plus, it tastes amazing so it is definitely worth the effort! 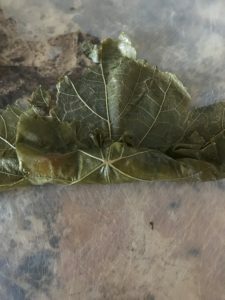 Grape leaves can be stuffed with various fillings. The most popular are minced meat with rice and spices or minced vegetables with rice and spices. I love both but definitely favor the veggie hence why I am sharing the recipe with you all! There is a nice tang from the lemon and pomegranate molasses. Also, who doesn’t love vegetables and rice cooked for hours. The grape leaves literally melt in your mouth. It’s so good! I show you step by step how to make them because sometimes the technical parts are the hardest. Hope you enjoy! Mix the ingredients of the liquid all together but adding the cardamon last. Taste it to see if it needs more salt or lemon. Mix all the stuffing ingredients together in a large bowl. Cover and refrigerate overnight or for a few hours. 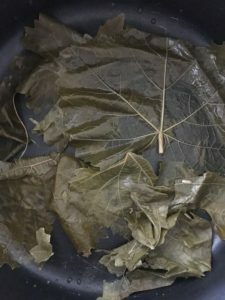 Soak the grape leaves in hot water for 5-10 minutes in a large pot over medium heat, drain them and then trim of stems if necessary. 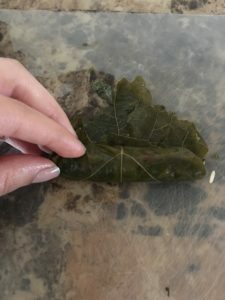 To stuff the grape leaves, lay one grape leaf on working surface with the shiny side facing down. 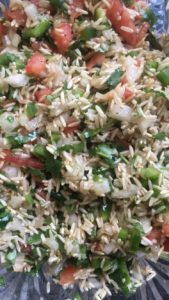 You will add the rice stuffing to the rigid side. Add about 2 tsp depending on size of grape leave across of the leaf above the stem. 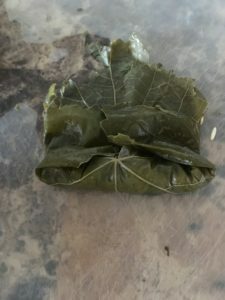 Fold the bottom of the leaf up over the stuffing, and then fold over the sides of the leaf onto the stuffing. Roll up the leaves making sure that the sides are tucked in as you go. 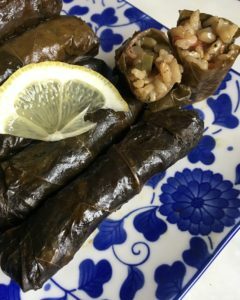 Roll somewhat tightly; you don’t want the rice falling out when the grape leaves cook. Line the bottom of a big pot with extra grape leaves, slices of tomato and or slices of potato. You can also add pieces of thin steak meat to the bottom as well. 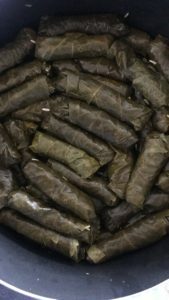 Start stacking the grape leaves on top of whatever you choose to line the bottom of the pot. Make sure they are tightly packed leaving no room for them busting open while cooking. Even though, you will always have 1-2 that are disobedient! Pour the liquid mix over the grape leaves after they are stacked. 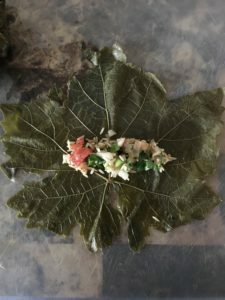 Place a fitting plate on top of the grape leaves. Make sure the liquid is covering the grape leaves entirely. If not, add more water to do so. Bring to boil over high heat, then cover the pot and let it simmer on low to medium heat for 2-2 1/2 hours till rice is tender. You can test one at about 2 hours in. Once slightly cooled, flip over the pot onto a large serving plate or just take them out gently from the pot one by one. Whatever you are more comfortable with. Serve with some salad and/or yogurt with a side of lemon wedges.